Pu-erh is renowned for its medicinal qualities. 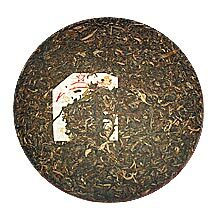 Unlike other teas, Pu-erh's quality and taste improves with age. It's taste is often described as earthy but some very well aged Pu-erh produce cups of incredibly smooth and wonderfully complex beverage. If you have purchased this tea before and wish to review it, please login to your account and click on the Review & Rate item link. Worldwide shipping cost at $3.80! FREE shipping for orders of $70 and above. Copyright © 2003-2019 TeaSpring.com. All rights reserved.